​Our industry connections help students build their future in real estate. The Burnham-Moores Center brings top real estate firms and executives together with our renowned academic community—so students can learn from industry experts in the classroom and find more opportunities in the workforce. Practical instruction from our outstanding faculty is enhanced by real-world insights from respected industry leaders. This gives our students a truly exceptional experience at USD—and the lasting connections they need to build lifelong real estate careers. 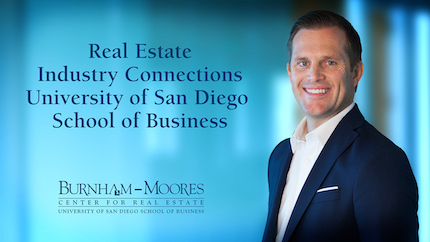 Our policy advisory board, BMC real estate committee, real estate faculty and BMC professionals offer exceptional education, mentoring and support of USD real estate students. Stay current on the latest trends in real estate and rub elbows with the "who's who" of the industry at our national and regional conferences.